I’ve been traveling in an unorthodox manner for 30 years. When vacation comes, I’m apt to jump a freight train rather than buy a plane ticket or rent a car. Freight trains cover the five-sixths of the U.S. rail network that passenger trains don’t. They took me to Western glories like the Modoc Plateau, Feather River Canyon, Black Rock Desert, Royal Gorge, Deschutes River Gorge, and Stampede Pass, where passenger trains stopped running decades ago. Some of those majestic routes have been abandoned since I rode them, so I was glad to catch them before time ran out. I’ve also pursued a hobby of seeking out archeological evidence of America’s rapidly vanishing industrial past. I explore abandoned buildings and head for the roof — for the expansive views — if it can support my weight. My Rust Belt travels have taken me to crumbling skyscrapers and train stations in cities such as Detroit, Buffalo, St. Louis, and Gary, where the great buildings rot in place, waiting for a heyday that will never come back. By the way, I don’t advise trying these activities. The law frowns on them, and when things go wrong, they go wrong in a hurry. But for the next few weeks hop in and enjoy the ride. I hope to entertain you with a collection of my short stories. 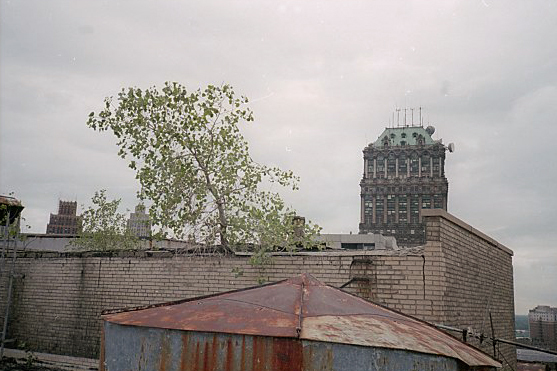 …a day spent climbing to the roofs of abandoned skyscrapers in the capital of abandoned downtowns, Detroit. Detroit is one of only three centers of pre-Depression skyscrapers in the world. New York and Chicago are the others. Flush with automotive wealth, the city’s tycoons put up the sort of architecture that one remembers from Lewis Hine’s photos of Empire State Building construction or from a stroll through the Sheep Meadows in Central Park: beige, dark brown, or black masonry buildings with far more character and artisanship than the glass boxes that the hideous 1960’s left us. In a different world, when everybody drove tail fins with 450-cubic-inch engines, the city hummed. The center of it, for many, was Hudson’s, the department store in a 20-story-plus skyscraper on Woodward Avenue. On weekends, families that looked like clones of the Cleavers journeyed to this Motor City version of Macy’s. Ask a middle-aged suburbanite about his or her childhood, and you will hear about visiting Santa at Hudson’s. The other side of the myth was that black people could not be hired unless they were no darker than a paper bag. When that rule eroded, the first black girl hired to work in the cafeteria was Diana Ross. Hudson’s closed in 1983, when sales in real dollars had fallen to 6 percent of those in 1953. In 1998, the city finally mustered enough money to implode it. The most tragic blow to Detroit was the savage race riot in 1967. Within five years, almost all the panicked whites had fled to the suburbs, taking corporate headquarters with them. Then people began to buy Japanese cars. Detroit sank into all-black poverty and isolation, and its glorious architectural legacy rotted in place. Now former luxury hotels, banks and office towers stand eerily dark at night, boarded up and marred by hundreds of shattered windows. Their interiors have been vandalized or looted by “miners” stripping away salable materials. The city is too poor to tear down the hulks. Today, trees of sometimes impressive heights sprout from the rooftops of derelict skyscrapers [above]. As the Free Press reported, ring-necked pheasants have reappeared in rusticated neighborhoods. The prairie is reclaiming the failed city. For years I had longed to do some urban exploring here, especially to climb to the roof of the abandoned, 18-story train station. In an anthropological way, I had always wanted to see this tragic place where “the wheels came off Western civilization,” as someone told Ze’ev Chafets. There were lessons here about the gulf between races, about the temporality of even the most seemingly powerful industries, about a country so wasteful that she throws away whole skyscrapers and cities when they cease to amuse her. But as long as I lived in California, I could not justify the cost of flying to Detroit. Being exiled to the East took care of that problem. Motor City has the worst attitude toward transit this side of LA, and the still-vengeful suburbs try to impede black city dwellers from coming out to visit. So the transit from the airport (21 miles out) is a two-hour, two-bus ordeal. Being in no hurry, I took the bus rather than capitulate to the Big 3 by renting a car. The scenery shifted from lower-middle-class strip malls to factory gates and weedy, abandoned properties. As the bus passed a succession of extremely undercapitalized small businesses, the derelict 18-story depot suddenly loomed to my left like some lost Gothic fortress. 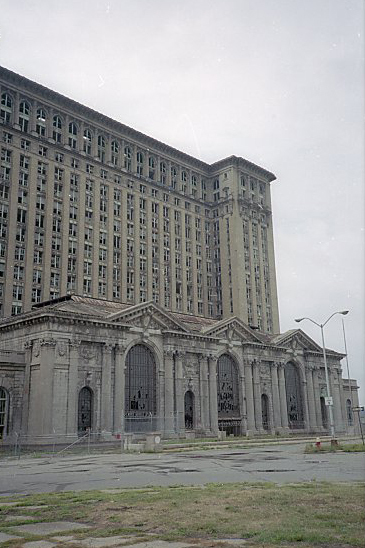 The Michigan Central station [above] was completed in 1913 by the same architects who built Grand Central and served ever fewer passengers until 1988, when Amtrak fled to a cheaper-to-heat, modest building north of downtown. Unique among train stations, an office building rises from the rear of the neoclassical depot. The station is not boarded up at all, but you have to get past a chain-link fence topped with barbed wire and concertina [below]. 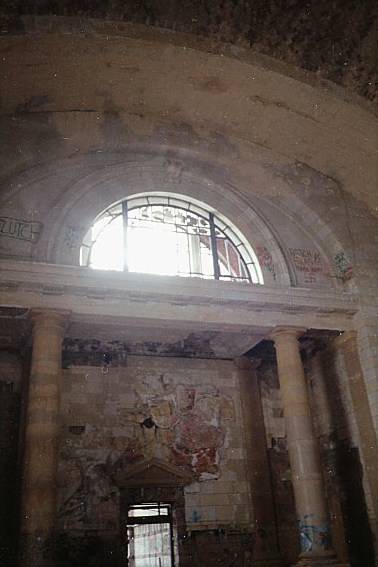 I stared up in awe at the 76-foot-high ceiling of the destroyed waiting room [below], which had become a repository of chipped pillars, piles of smashed marble and glass, and badly mutilated classical carvings. Everywhere that an idiot could reach, multicolored graffiti boasted and threatened. Furthermore, 13 years of exposure to the elements had devastated the interior. I hit the stairs to the roof. Thieves had stripped the banisters long ago, so I stayed on the wall side. Sweating in the wretched humidity, legs and lungs aching in the badly circulated air, I scaled flight after flight past hallways of dead pigeons and smashed linoleum and marble paneling. Where the air crackled with voices and telephones, now there was nothing but my slow tread on spongy steps. The roof [see feature photo], like so many others in this dead city, was populated by hardy urban trees that had taken root in various corners and crevices. It commanded a view of still-active railroad tracks veering into a tunnel to Canada; a decrepit, massive post office; the likewise abandoned Tiger Stadium, where Cobb, Greenberg, Gehringer and Kaline had played; and the elegant Ambassador Bridge arching to Windsor, Ontario. A mile to the east stood the knot of inner-city skyscrapers where I planned to besiege the Book-Cadillac Hotel. I went partway up a smokestack towering an additional two stories above the roof [above] but lost heart a third of the way up. 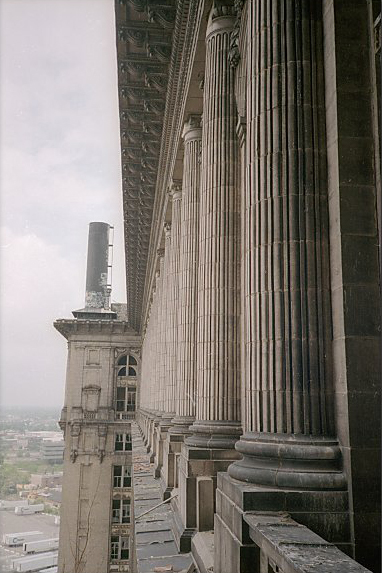 The ladder was unanchored at the bottom, causing it to sway; worse yet, the smokestack was situated not on the center of the roof but rather on a corner. If the ladder failed or if I slipped off, it would be a merry 200-foot ride to the tracks below. I silently saluted the graffiti artists who had left their mark on the smokestack’s summit and descended. Some people just have no fear of heights. As I exited the building, I was spooked to hear a cell phone ringing a few floors below. A guard? Another urban explorer? Who wanted to find out? I crossed the length of the building and used the other staircase. 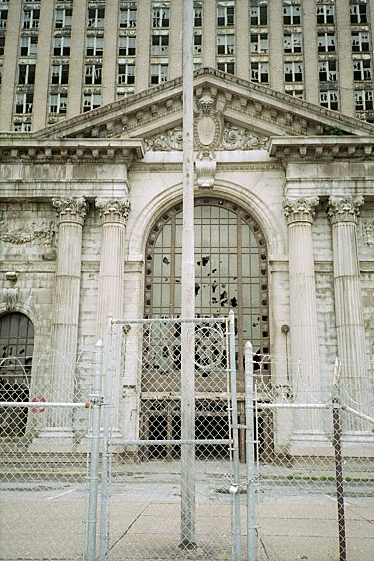 My next target was the Book-Cadillac [above], once Detroit’s leading hotel but now boarded up for decades. Twenty-seven stories tall and host to a series of Presidents ending with JFK, it is still topped by the large, deteriorating letters CADILLAC. It would have been a superb experience to reach the top and stand beside the marquee. It was not to be, though. The openings described on the Web by earlier visitors had been nailed and epoxied shut. I soldiered on to the nearby consolation prize, the old Statler Hotel [below] that closed out its life as the Detroit Hilton in 1975. 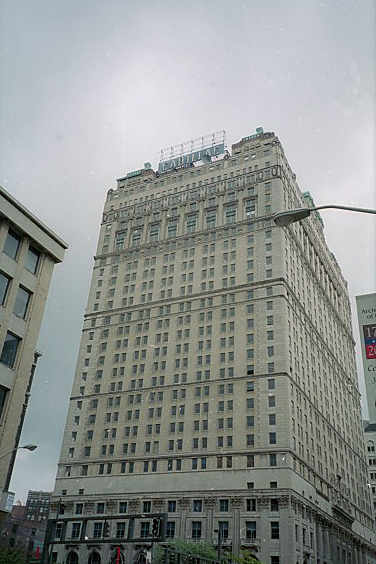 Built in 1914, it stood 18 stories high and was touted for having “1,000 rooms, 1,000 baths.” The entire Statler chain, a well-known name in early-20th-century hotels, was sold to Conrad Hilton in 1954. One can richly take advantage of the desolation of downtown Detroit. There was a row of semicircular windows about 10 feet up along the back of the Statler, shielded by decaying awnings, but this was the one spot where two elderly men were talking. I waited for them to leave and assessed the different windows. Through luck and attention, I managed to be firmly planted on the sidewalk grinning vacuously whenever a squad car passed by. At 4:30 p.m., with the help of boards nailed in by some earlier miscreant, I cranked myself onto the sill of a broken window. Now completely inside the awning, I could not be seen unless someone stood directly beneath me. I wound up in some mechanical or electrical room, definitely not a guest area. There were piles of incomprehensible wreckage to pick through. To my alarm, I could not initially find a way upstairs as I headed deeper into the building, not until my flashlight beam caught the outline of a staircase in the ceiling. In a few minutes, I was plodding past now-familiar territory: corridors strewn with broken plaster and shattered guest rooms where nothing remained except vandalized bathtubs and toilets; the rooms looked as if the Battle of Stalingrad had been fought within them. The much-despised miners had cleaned out the Statler, stealing everything from switch plates to banisters. On the wallpaper, you could still make out old Statler crests. Oddly, I never did find the lobby on my way up. There was a wood-paneled manager’s office where I found a dusty bookkeeping ledger for 1938 to 1943. The view from this particular tree-studded roof, in the heart of downtown, was somewhat different from that afforded by the depot one mile out. Now I was right up against the Book-Cadillac and the other skyscrapers, all seemingly within a broad jump. In faded, old-fashioned script stenciled on countless organs, “Wurlitzer” crept across the side of a six-story building. In the old days, that had reputedly been the world’s largest music store. 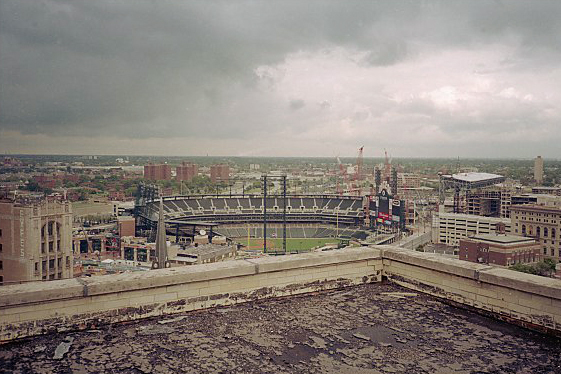 To the north was the Tigers’ current home, Comerica Park [below]. Hanging around on the roof, or anywhere else, was perilous. Abandoned buildings have had most of their doors, fans, and metal housings stolen for salvage value, so elevator shafts and air shafts all gape open. Urban legend has it that explorers once found a paintballer’s skeleton, still clad in fatigues, at the bottom of an elevator shaft and that another explorer jumped from one roof to another to hit a pile of leaves. He crashed through a skylight under the leaves and died. Be careless on the roof and you could take a duct ride to the furnace room. From down below, the music of a live band floated up, a lonely effort to dispel the perpetual silence that strangles Detroit. 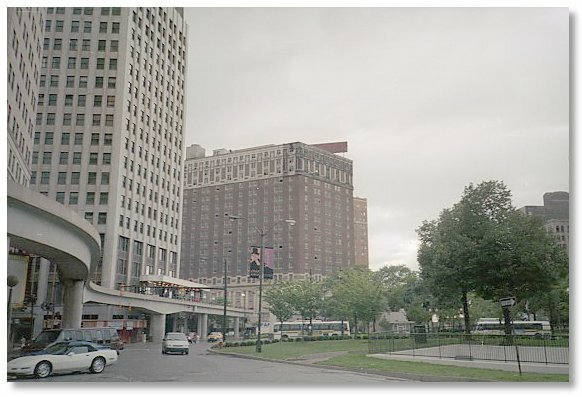 Beside Comerica, radiating northward from Grand Circus Park, Woodward Avenue pointed to the suburbs and to Canada. Having seen my fill, I plunged back down the stairs. Despite my best efforts, when I returned to the junk-filled equipment rooms, I could not retrace the route to the row of windows where I had dropped in. It was now past 6, and the last thing that I wanted was to be trapped inside an abandoned inner-city building after dark. 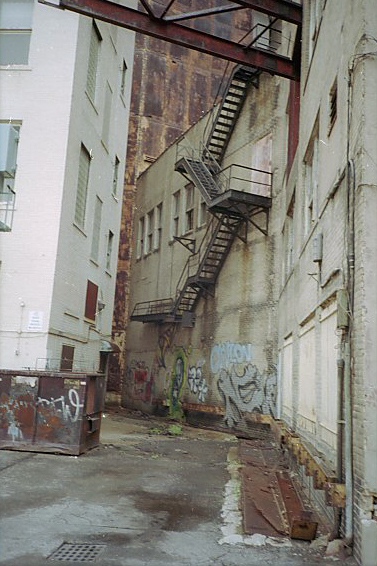 Forced to climb the rusted remains of a boiler onto a ledge, I found a fire escape over an inner alley [below]. At least no police cars would catch me here, but it was a typically intimidating urban fire escape clinging to a brick wall. The last flight of steps was padlocked into horizontal position, higher off the ground than I would like. If I hung from it by my fingertips, I would still be about a story off the ground. Dangling in mid-air, I gingerly hand-walked to the lowest possible point of the slightly sloping steps. There was an annoying guardrail projecting from the building. If I hit it on the way down, which a straight fall would make inevitable, my landing would be completely ruined and I would probably be injured. Limping around Detroit at night? I had to throw myself backward when I let go. This was similar to the time seven years ago when I had to jump out from a bridge to clear a concrete piling. I made it, landing with a huge, springy crash on a grating. There were no witnesses. Within 15 minutes I was riding the Tunnel Bus to Ontario, surely the only transit bus to cross the Canadian border. Quaffing Pepsis at a casino eatery with free refills until I attained a semblance of feeling human, I crossed back to the despairing American side and caught the 9:28 p.m. bus toward the airport. Detroit being what it is, the last transit bus that connects to its own airport on Sundays leaves at 7:23 p.m. I plodded 90 minutes on foot to catch my plane. On the one hand, we are coming off an amazing period of prosperity that has reached almost every corner of the country. On the other hand, we have pictures like Detroit’s: racial problems that never heal, an impulse to escape them by building ever farther out and by making no allowances for those without access to cars, an impatience with downtowns that have become too old and worn down to be instantly profitable. Sometimes I think that Detroit, more than a nightmare, is our future.